The processing of organic spices from its own facility began in March 2005. 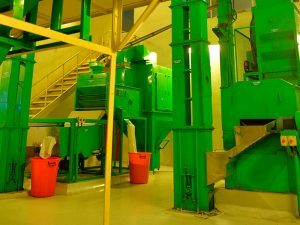 The unit is fully dedicated to processing of organic spices and has a capacity to process 1 MT spices/hour. Here the purchased materials are stored, cleaned, graded, sterilized, dried, ground and packed for export and domestic markets. The design and construction of the facility conforms to the international standards for food processing units. This unit is certified as per the standards of ISO 22000 FSMS and British Retail Consortium (BRC). The processing is done using Indian and imported machines. The process flow includes raw material storage, cleaning, grading, steam sterilization, drying and packing. Based on orders the steam sterilized products are also offered in powder forms in different granulations. It has a well-equipped in house quality assurance laboratory to ensure the quality of products arrived and dispatched. It has the capacity to analyze microbiological parameters like Total plate count, E.coli, coliforms, Bacillus cereus, Staphylococcus, Salmonella, Yeast and mould and chemical parameters like, moisture, volatile oil, total ash, Acid insoluble ash other parameters like bulk density, light berries etc. The facility is located in a very serene environment away from all pollutions at Valanjanganam, near Kuttikanam. It has facilitates for separate stores for raw materials, finished goods, tools and packing materials. 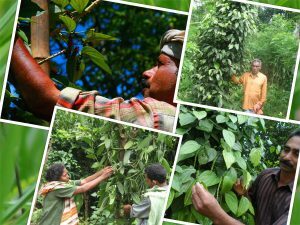 PDS Organic Spices works with the small and marginal farmers and tribals spread across the villages of Idukki, Kottayam and Pathanamthitta districts in the state of Kerala. We provide all possible assistance to follow organic farming, help in value addition and improvement in quality of the producers, purchase the produces at premium price from the farm gates, inspect and monitor the farming activities, process the produces in our own facility and market them in international and domestic markets. By now, almost 2000 small farmers are registered as organic farmers at PDS Organic Spices. The first step in becoming an organic farmer is to submit an application, mostly through the local Self help Group (SHG). The “Internal Control System” (ICS) of PDS Organic Spices that coordinates the cooperation between the local farmers and processing of the spices is also responsible for the certification process. Divided into nine regions, the Internal Control Inspector in charge will do an inspection visit at the applicant’s farm in order to check whether the details given in the application were correct. He will submit a report along with the application to the PDS Organic Spice Division that approves the application. Once the application is approved, a three-year transformation period will follow in which the farmer adjusts his cultivation to the relevant organic standards. Throughout the certification process, the farmers are supported with trainings on good organic farming practices and are regularly visited by the ICI who documents the development, supports the farmers and helps in handling the certification process. After three years, the farmer receives his certification.